Sitting at the end of Ebenezer Place, Nano Ready 2 Go, known as 'Nano's', is another one of Adelaide's largely hidden gems. Serving up a variety of Italian cuisine and other longstanding favourites, Nano's is a great place to stop that avoids the crowds often found in more commonly frequented locations. However, just because Nano's is a "hidden" café, this does not mean it cannot attract a crowd. In peak lunch periods it can be difficult to secure a table, even with ample indoor and outdoor seating space provided. 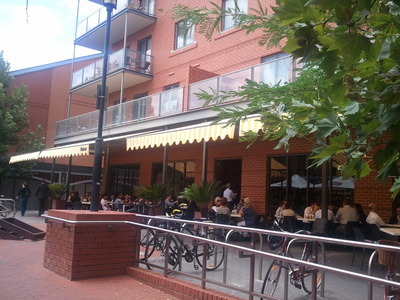 Furthermore, all outdoor seating is covered by a large shade, meaning diners are protected from any rain and do not need to worry about facing directly into the sun. Nano's offers a wide range of ready made pizzas and 'Nano stix', the latter essentially being toasted focaccias sliced into narrow (but sizeable) strips. Both styles feature a variety of toppings or fillings, often pairing chicken, tuna or cold meats with salad or vegetables. There is also a range of ready to eat desserts, including sweet delicacies such as Italian doughnuts and pastries. Additionally, Nano's serves breakfast until 3pm, making this an ideal brunch spot. One breakfast option is eggs (scrambled or fried) with a toasted roll and any number of optional accompaniments including bacon, tomato and spinach. This can be teamed with a glass of freshly squeezed orange juice or coffee to make a more than satisfying meal. Being a café, naturally Nano's offers an extensive range of coffees. However, there are also delectable cold drinks such as iced coffee or chocolate, which are worth sampling either with a meal or as a treat. If any of these beverages do not appeal, iced teas, soft drinks and Italian sparkling fruit juices are available. It is often said that a busy eatery is a sign of quality cuisine. Using this logic the dishes at Nano's are of a high standard. Furnished with contemporary décor, housing a menu filled with options and set in relaxed surrounds, Nano's is a "hidden" café worth visiting.